And thank god for that. The problem for me with Godard is that he never grew past the initial tinkering with the nature of cinema and developed it into a hearty statement driven home with each new film. 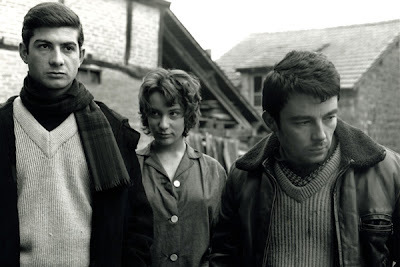 Chabrol may have gone the straightforward story route, but as evidenced by his late to final works, he developed it, moved it forward and that's where I think Godard failed. Of course, I haven't seen Godard's latest so maybe it's finally occurred. We'll see. the crime genre, which, yes, also interested Godard and Truffaut and so on, but they seemed more interested in taking it apart or pushing it off a cliff. And this relates directly to the above, again. With Godard, the deconstruction was elemental, taking apart major motifs the audience can easily identify while Chabrol deconstructs perhaps much more by slowly redefining the genre. My next Chabrol is L'Enfer which I got from Netflix about a week ago. I haven't read up on its plot so as not to spoil anything but once I see it, I'm going to write it up. These are on my list to see as well but much further down the road (there's still so many others I haven't seen, including Pleasure Party). It is, I suppose, a matter of taste. I guess. I just see Godard as so much formal gamesmenship, and past that into what he's trying to say...well, whatever it is, I'm agin it, I suppose. He does not thrill me, is the only thing I can think to say at this point. Chabrol is classical, and I suppose the truth of the matter is, that's what I like. I'm not a big fan of genre deconstruction in general, and often when it's done, or at least someone claims that it's been done, as in DRIVE, I think "No...no, it's a crime movie. The fact that it doesn't read to you as exactly the same as the last crime movie you saw doesn't mean it's being deconstructed." I think your point about Chabrol redefining the genre is a good one, because he certainly is striking out with his own brand of not only crime, but psychological...er...thrillers, I guess, for lack of a better word. As I say, he seems philosophically joined at the hip with novelists like Ruth Rendell, but it's an unusual type of genre filmmaking that is at once part of a recognizable genre but would seem very far apart from others of its type, those of a more traditional bent. I haven't seen L'ENFER. Let me know what you think. Qwikster is deconstructing DVD by Mail. Assholes.